Real Estate Market Update — The National Association of Realtors Chief Economist Lawrence Yun says that “the national housing market is nearly stalled due to a lack of supply.” This theme resonates in our Triangle real estate market, although we are experiencing fairly robust activity, despite inventory challenges. North Carolina is now the 9th most populous state with 4 Triangle Counties among the fastest growing in NC since 2010: Wake (+16%), Chatham (+14%), Durham (+13%), and Johnston (+13%). The Raleigh-Cary Metro area population grew by 2.5% in 2016 alone, and is the 14th fastest growing region in the US. The Durham-Chapel Hill Area grew by about 1.5% in 2016. Fueling this growth is the general migration pattern in the US from North to South. Newcomers are attracted to our climate, employment opportunities, affordable housing, quality of life, healthcare, and by their adult children who moved here over the past 15-20 years – “trailing grandparents”. Immigrants and investors have also contributed to growth in our area, including sizeable Mexican, Asian, and Indian populations. One less obvious factor influencing the market, especially at the entry level, are the increasing number of investors who are flipping homes, and who now account for nearly 6% of purchases nationwide. All of these factors are driving the robust demand and appreciation impacting our real estate market, so let’s look at an overview of the trends and statistics of the Triangle, and then try to unpack some of this data for several of our submarkets such as Chapel Hill-Carrboro, Durham, Chatham, and Cary-Apex. We are now in a strong “Seller’s Market” in the Triangle due to increasing demand for housing, decreasing inventory of homes, and historically low interest rates. The average “Days on Market” is now under 2 months, with about 2.5 months of inventory in pre-owned homes. New construction inventory is 3.5 months, with 1.5 months of inventory for townhomes and condos. 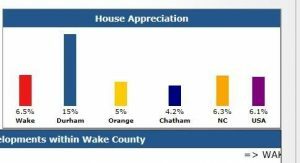 With strong demand for housing coupled with low inventory, appreciation is gaining ground in the Triangle, ranging from a low of 4.2% in Chatham County to 15% in Durham, with 5-6% per year appreciation for most of the remaining Triangle regions. Average median sales price is up 6.5% over the past year (Sept 16- Sept 17) to $264,000, and overall sales were up 4.5% for the same period. The strongest sales volume has been for 4+ bedroom detached homes over $300,000. However, the fastest pace of sales has been for homes under $200,000, selling in just under 30 days. “Metrostudy’s New Construction Survey” of the Triangle housing market shows that 2,547 new homes were started in the first quarter of 2017, up 4.3% from 1Q16. Annual housing starts through the end of 1Q17 were 8.5% higher than for the same period in 2016, and annual closings for new construction were up 11.5%. The average sale price of a new home was up 15% with the most popular price point in the $300K – $399K range. Lot sales increased by 23% to 12,050 units for the year ending 1Q17. Year to date (Sept 2017), listings and closings are down 4% an 1% respectively, compared with the same period in 2016. There are 3.7 months of inventory now, and the average Days on Market is 54. Median sale price is up 0.6% to $360,000 with sellers seeing 97.4 % of their original asking price. There seems to be downward pressure on prices from new construction and affordable alternatives in neighboring areas such as Chatham, Hillsborough, and Southwest Durham. There were 5.7% fewer listings in 2017 and 2% fewer sales, but the median price increased by 6.7% to $240,000, and homes sold for 99.2% of asking price. There is only about a month of inventory available, so the pace is quick for sales in Southwest Durham, especially in “tried and true” subdivisions such as Woodcroft, Twelve Oaks, and Hope Valley Farms. Some higher end homes such as those in Colvard Farms have longer market times and more price concessions to reach a sale. Drees, Toll Brothers, Terramoor, and Pulte all have new home communities active in this market. 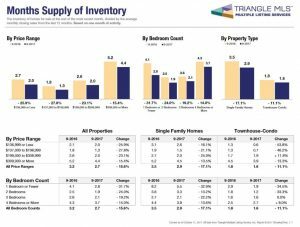 Again, inventory is down to 2 months supply with fewer new listings coming online, and 4% more closings over the same period last year, so demand is there. Prices reflect this tight supply of homes and are up 9% over the past year, with the median home price at $229,000. Days on market is down to about a month. The most active price point is under $399K. Entry level homes within walking/biking range of downtown are often under contract within days and with multiple offers due to the rejuvenation of downtown Durham. This region has been very active with high demand and increasing prices, with new construction balancing out some of that demand. Bella Casa subdivision in Apex has closed 33 new homes averaging $509K just in the third quarter of 2017. Lochmere, Cary Park, and Kitts Creek had strong resales of over 20 homes each in the third quarter of 2017 with an average home price close to $400K. 4,100 of the 5,400 homes listed this year to date have been absorbed with an average of 31 days on market. Cary and the Apex-Holly Springs Area continue as popular destinations for transplants seeking affordable, newer home options that are close to Raleigh and RTP. 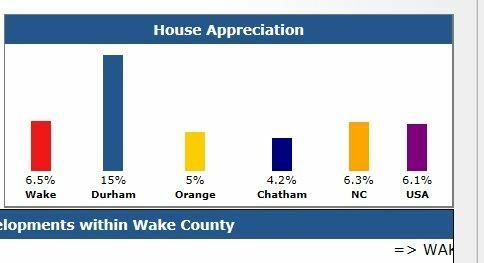 14% more homes closed in Chatham County this year to date (Sept ‘17) compared with the same period in 2016, with the median sales price up 4.5% to $365,000. There are over 450 homes currently for sale in Chatham with an inventory of about 4 months and “Days on Market” of 2 months. Much of this inventory is new construction such as Briar Chapel (about 2 yrs. inventory left), Chapel Ridge, Westfall, Legacy at Jordan Lake, and so on. Prices have rebounded significantly, but not completely, from lows in the 2008-2010 years. Chatham is still an affordable alternative compared with some other regions of the Triangle, and remains a desirable destination for “tax refugees” and “downsizers” from Chapel Hill-Carrboro, Cary, and Durham. Retirees and transplants also abound, as in Fearrington Village and Briar Chapel. Chatham Park is the “800-pound gorilla” in this room with 7,100 acres of mixed use community, and 60,000 potential new residents in 22,000 homes. Construction of homes will reportedly begin in North Village near Bynum by early 2018. If you are interested in learning about available properties in the greater Triangle area, visit us online. Call us today at 919-928-5131 or e-mail us at [email protected] for additional information.